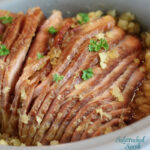 Crockpot Spiral Ham is our go-to recipe for holiday and family gatherings! It’s juicy and tender with just the right amount of sweetness, and it’s so easy to make in the Crockpot. This is a recipe that everyone will love! We love Crockpot Pork recipes. Some of our favorites include The Best Crockpot Ribs Recipe and Slow Cooker Pork Chops and Potatoes. Spiral ham is a favorite at our house around holiday time, especially Easter and Christmas. 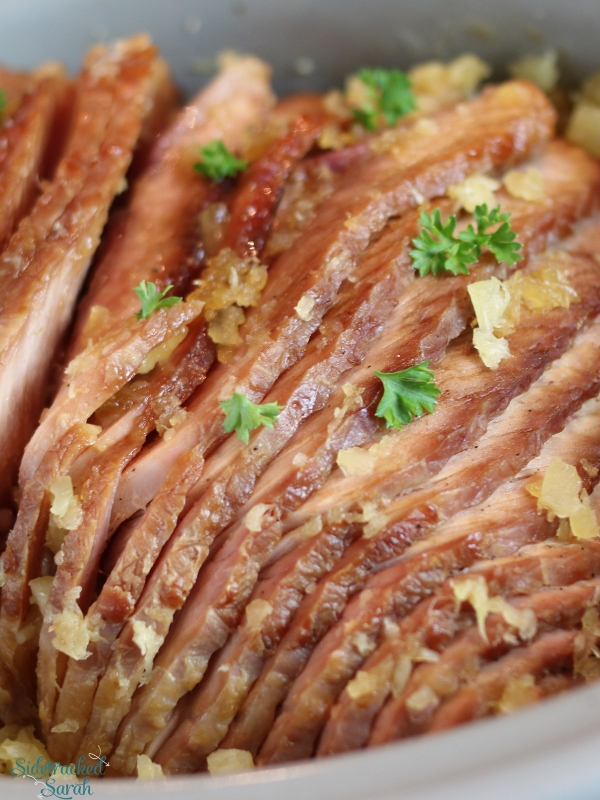 It’s not just a holiday dish, though – spiral ham is delicious any time of year! In the oven though, it’s kind of a hassle to make, which is why it often only shows up on holiday tables. This is no longer the case, though! With my Crockpot Spiral Ham recipe, you can make it any time! This beauty is impressive enough to be the centerpiece of your holiday feast, but it’s also easy enough to make for a weekend meal or weeknight dinner. The leftovers can also be used in so many wonderful ways! WHAT SIZE HAM SHOULD I BUY FOR CROCKPOT SPIRAL HAM? This will depend largely on the size of your Crockpot, but I would recommend not going above 7 to 8 pounds. An oval Crockpot will work best for this recipe. If you have a smaller Crockpot, it’s fine to trim the ham a bit so that it will fit. WHAT IS THE BENEFIT OF COOKING A SPIRAL HAM IN THE CROCKPOT? There are so many benefits to the Crockpot Spiral Ham! Cooking it in the Crockpot frees up the oven; if you’re cooking for a holiday dinner, this makes such a difference! You can easily bake desserts, warm up rolls, or cook side dishes while the ham is happily simmering away in the slow cooker. Your kitchen will also smell amazing! 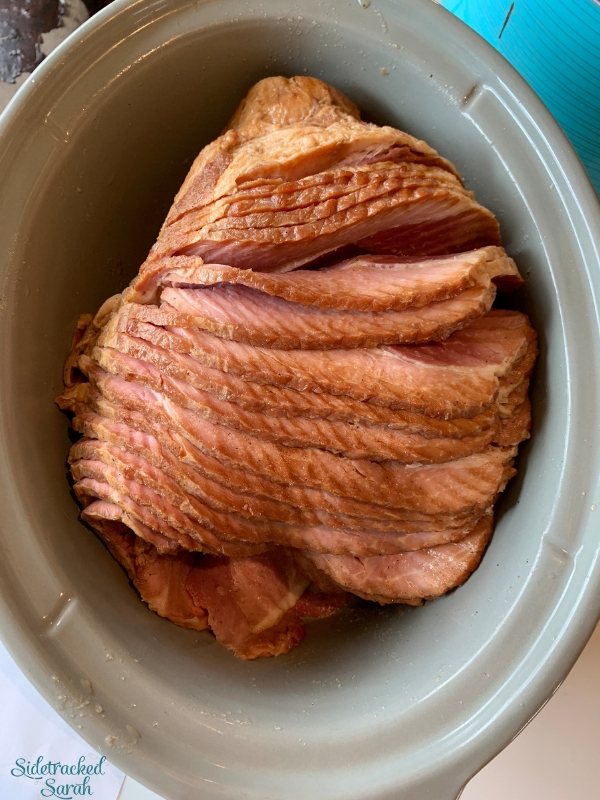 Additionally, Crockpot Spiral Ham stays delicious and juicy! Often, oven-baked ham becomes dry; the cooking environment just doesn’t work well with a lean meat like ham. In the Crockpot though, the moisture can’t escape, so the ham can’t dry out! The result is just plain amazing. It comes out perfect every time! The clean up is also really easy in the Crockpot. 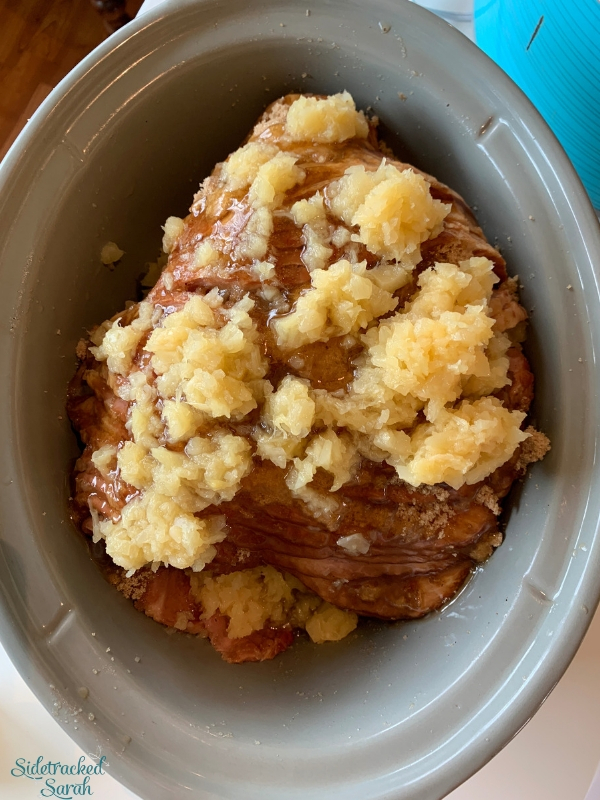 Instead of trying to scrub off bits of baked-on glaze and ham from a roasting pan, the enamel surface of the Crockpot liner is easy to wash. It’s convenient to cook, fun to eat, and easy to clean. This recipe sounds like a winner to me! WILL CROCKPOT SPIRAL HAM FREEZE WELL? If you’re making this dish for a holiday gathering, chances are you won’t have any leftovers. That’s ok! It’s easy enough to make any time, and when you do have leftovers, they freeze wonderfully! You can use the leftovers in so many ways; let your creative juices flow! WANT MORE EASY CROCKPOT PORK RECIPES? Place spiral cut ham in slow cooker. Pour brown sugar, honey and crushed pineapple over the top. If desired, remove liquid and cook down in a saucepan for a thickened sauce.